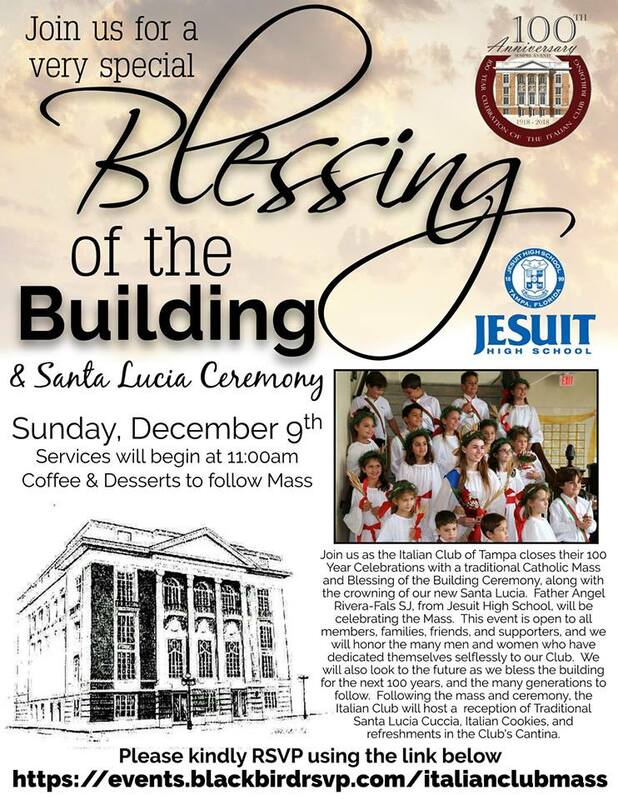 Join us as the Italian Club of Tampa closes their 100 Year Celebrations with a traditional Catholic Mass and Blessing of the Building Ceremony, along with the crowning of our new Santa Lucia. Father Angel Rivera-Fals SJ, from Jesuit High School, will be celebrating the Mass. This event is open to all members, families, friends, and supporters, and we will honor the many men and women who have dedicated themselves selflessly to our Club. We will also look to the future as we bless the building for the next 100 years, and the many generations to follow. Following the mass and ceremony, the Italian Club will host a reception of Traditional Santa Lucia Cuccia, Italian Cookies, and refreshments in the Club’s Cantina. No charge to attend – please RSVP at https://events.blackbirdrsvp.com/italianclubmass.